Gopinath is one of the world’s outstanding economists, with impeccable academic credentials, the IMF said today. 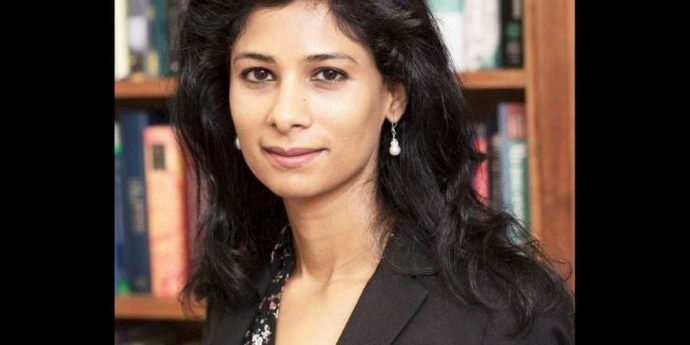 New Delhi 1st October 2018: India-born economist Gita Gopinath Monday appointed as chief economist of International Monetary Fund, the IMF said in a statement. Gopinath will succeed Maurice (Maury) Obstfeld, who would retire at the end of 2018, the IMF said. “Gopinath is one of the world’s outstanding economists, with impeccable academic credentials, a proven track record of intellectual leadership, and extensive international experience,” IMF Managing Director Christine Lagarde said. Gopinath did her Ph.D. in economics from Princeton University in 2001 after earning a B.A. from the University of Delhi and M.A. degrees from both the Delhi School of Economics and University of Washington.